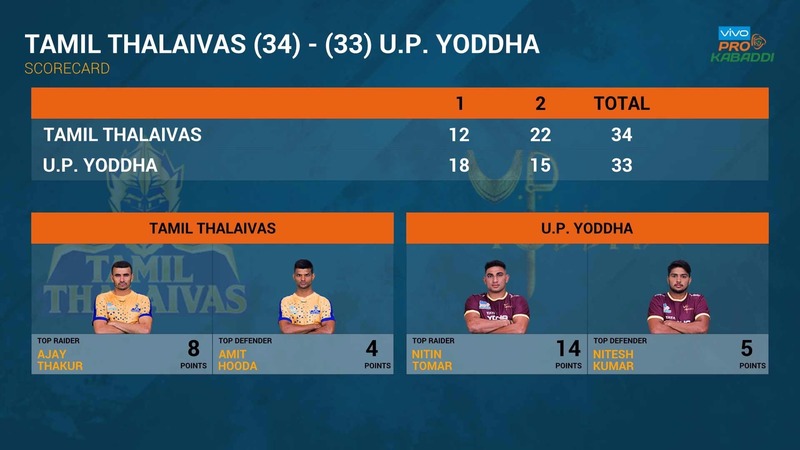 Tamil Thalaivas edged U.P. Yoddha 34-33 at the Motilal Nehru School of Sports in Sonepat on Wednesday. 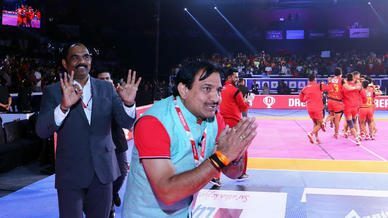 Lucknow’s Nitin Tomar notched up a game-high 14 points but Ajay Thakur, who picked up eight points, was the real star of the show since it was his super raid in the closing seconds of the match that made the difference. Lucknow made a rapid start to the match by registering the first All-Out of the match on Chennai in the fourth minute to take a 9-1 lead. The Thalaivas returned to the mat with a bit more sense of purpose and made the score 13-8 in the 13th minute after a super raid by K. Prapanjan. Both teams continued to score freely as the opening period neared its conclusion. Tomar and Rishank Devadiga were Lucknow’s main threat in attack, while Thakur and Prapanjan were Chennai’s protagonists in offence. 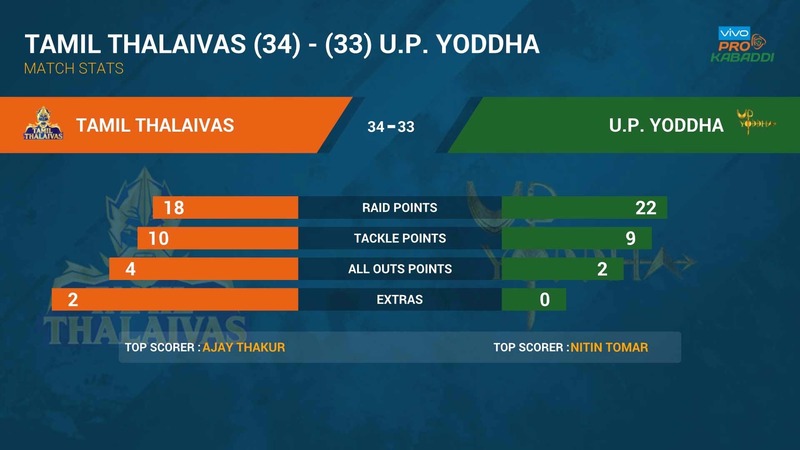 The half ended with the score 18-12 in favour of Lucknow but the southerners could take heart from the fact that they had reduced the Yoddha to just two men. 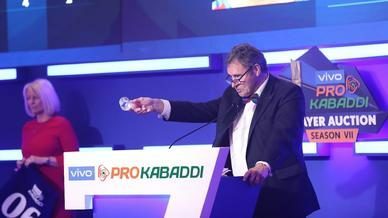 Chennai started the second period better than they did the first by enforcing an All-Out on Lucknow in 22nd minute to cut the lead down to 20-16. Lucknow skipper Tomar though kept troubling Chennai’s defence and brought up his Super 10 just two minutes later. 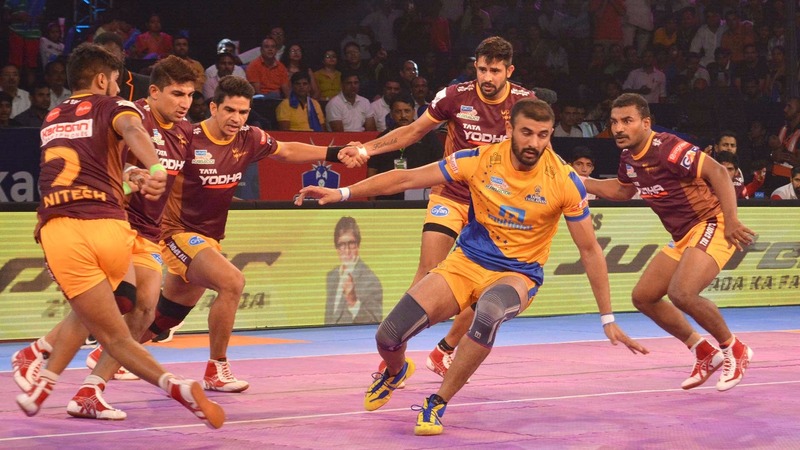 Lucknow and Chennai kept trading blows as the half progressed with the game finely poised at 23-20 heading into the final 10 minutes of the encounter. However, the Yoddha defence, especially, Jeeva Kumar and Nitesh Kumar – who picked up a High 5 – raised their game and made some crunch tackles at crucial junctures to momentarily thwart Chennai’s charge. 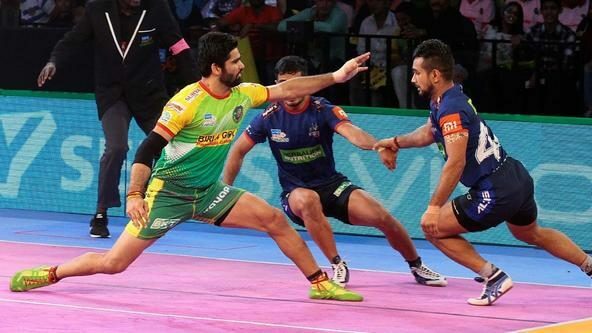 Prapanjan though altered the course of the game yet again with four minutes on the clock, thanks to a two-point raid that heralded in a second All-Out on Lucknow soon after to give Chennai a 29-28 lead for the first time in the game. Lucknow weren’t behind for too long as Tomar pulled off a brilliant super raid moments later to turn the game in favour of his side. Thakur pulled one back for Chennai to make it a one-point game with a minute left to play. 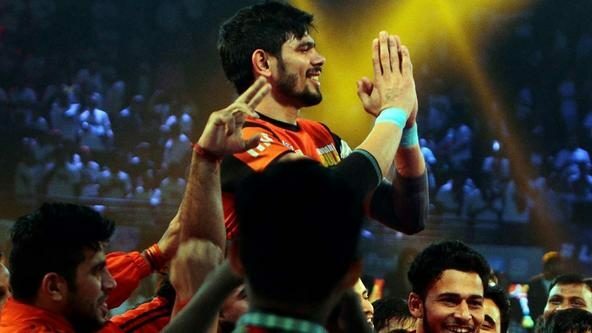 His next raid for Chennai was even better and effectively clinched the game for his team after a three-point super raid did the damage and handed the Thalaivas enough breathing space for their second win of the season.